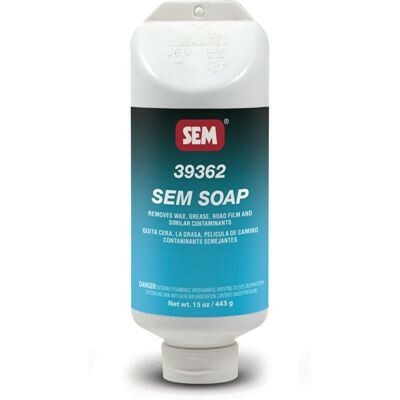 SEM Soap is a first step cleaner for all repair and refinishing procedures. It gravitates into the pores of the substrate and floats contaminates to the surface. Contains a slight abrasive to open the substrate for greater adhesion. Features: Removes wax, grease, road film and tar, great prep cleaner for numerous substrates, VOC compliant and environmentally safe, emulsifies contaminates for easy disposal and great for cleaning chrome, rubber and white wall tires.